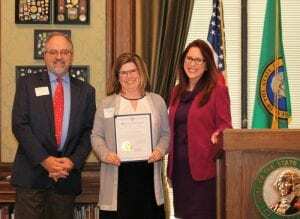 SCJ has won numerous awards for workplace culture and growth, including this recognition from the Washington Secretary of State’s Corporations for Communities award in 2017. Photo courtesy: SCJ Alliance. Twenty-eight years later, that desire has clearly been fulfilled. 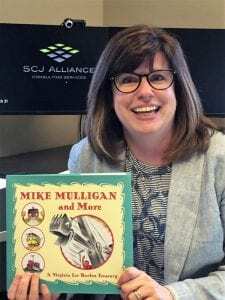 As co-founder of SCJ Alliance, along with Perry Shea and Bob Jewell, Carr has been one of the driving forces behind a company that routinely tops regional lists of Best Places to Work while continuing to attract new business and expanding to 100 employees. 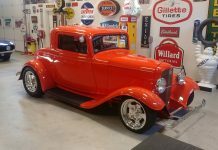 Recently Carr took over Shea’s post as President and CEO of the company, a transition that has been in the making for years. “We’ve been planning for leadership transition over time from the beginning,” she says. The company’s 12th anniversary at the flagship Lacey office was a festive affair. Photo courtesy: SCJ Alliance. 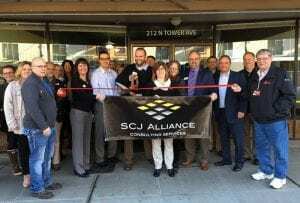 In the past 12 years, SCJ has opened offices all over Washington State, including this one in Centralia. Photo courtesy: SCJ Alliance. SCJ regularly supports local nonprofits. Carr is shown here promoting the annual South Sound Reading Foundation’s Readers are Leaders fundraising breakfast which SCJ has sponsored for many years. Photo courtesy: SCJ Alliance. For more information, visit the SCJ Alliance website or call 360-669-0700.